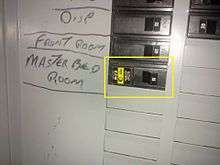 This AFCI (the circuit breaker with the yellow label) is an older generation AFCI circuit breaker. The current (as of 2013) devices are referred to as "combination type" and usually appear with a green label. An Arc Fault Circuit Interrupter (AFCI) is a type of duplex receptacle or circuit breaker that breaks the circuit when it detects a dangerous electrical arc in order to prevent electrical fires. An AFCI distinguishes between a harmless arc that occurs incidental to normal operation of switches, plugs, and brushed motors, and an undesirable arc that can occur, for example, in a lamp cord which has a broken conductor. AFCI breakers have been required for circuits feeding electrical outlets in bedrooms of homes by the electrical codes of Canada and the United States since the beginning of the 21st century; since 2014, U.S. code has required them for outlets in most rooms in houses. The advanced electronics inside an AFCI breaker detect sudden bursts of electric current in milliseconds; long before a standard circuit breaker or fuse would trip. A "combination AFCI breaker" will provide protection against parallel arcing (line to neutral), series arcing (a loose, broken, or otherwise high resistance segment in a single line), ground arcing (from line, or neutral, to ground), overload protection and short circuit protection. OBC AFCI Receptacles contain electronic components within the device that constantly monitor a circuit for the presence of “normal” and “dangerous” arcing conditions. Based upon an established threshold in the sine wave, the AFCI can be triggered to quickly react and de-power a circuit if “dangerous” arcing is detected. When installed as the first outlet on a branch circuit, AFCI receptacles provide series arc protection for the entire branch circuit. They also provide parallel arc protection for the branch circuit starting at the AFCI receptacle. Unlike AFCI breakers, AFCI receptacles may be used on any wiring system regardless of the panel. Starting with the 1999 version of the National Electrical Code (NFPA 70) in the United States, and the 2002 version of the Canadian Electrical Code in Canada (CSA Standard C22.1), the national codes require AFCIs in all circuits that feed outlets in bedrooms of dwelling units. As of the 2014 version of the NEC, AFCI protection is required on all branch circuits supplying outlets or devices installed in dwelling unit kitchens, family rooms, dining rooms, living rooms, parlors, libraries, dens, bedrooms, sunrooms, recreation rooms, closets, hallways, laundry areas, or similar rooms or areas. They are also required in dormitory units. This requirement may be accomplished by using a "combination type" breaker - a kind of circuit-breaker (defined by UL 1699) - in the breaker panel that provides combined arc-fault and overcurrent protection or by using an OBC AFCI Receptacle for modifications/extensions, as replacement receptacles or in new construction, at the first outlet on the branch. Not all United States jurisdictions have adopted the AFCI requirements of the NEC as written so it is important to check local Code requirements. The AFCI is intended to prevent fire from arcs. AFCI circuit breakers are designed to meet one of two standards as specified by UL 1699: "branch" type or "combination" type (note: the Canadian Electrical Code uses different terminology but similar technical requirements). A branch type AFCI trips on 75 amperes of arcing current from the line wire to either the neutral or ground wire. A combination type adds series arcing detection to branch type performance. Combination type AFCIs trip on 5 amperes of series arcing. AFCI receptacles, specifically Outlet Branch Circuit (OBC) AFCI Receptacles, are an alternative solution to AFCI Breakers. These receptacles are designed to address the dangers associated with both types of potentially hazardous arcing – parallel and series. AFCI receptacles offer the benefit of localized TEST and RESET with these buttons located on the face of the device itself. This is very convenient and saves a trip to the breaker panel. In 2002, the NEC removed the word "receptacle", leaving "outlets", with the effect that lights and other wired-in devices such as ceiling fans within bedrooms of dwellings were added to the requirement. The 2005 code made it clearer that all outlets must be protected despite discussion in the code-making panel about excluding bedroom smoke detectors from the requirement. "Outlets" as defined in the NEC includes receptacles, light fixtures and smoke alarms, among other things — basically, any point where electricity is used to power something is an outlet. As of January 2008, only "combination type" AFCIs will meet the NEC requirement. The 2008 NEC requires the installation of combination-type AFCIs in all 15 and 20 ampere residential circuits with the exception of laundries, kitchens, bathrooms, garages and unfinished basements, many of which would require GFCI protection. The 2014 NEC adds kitchens and laundry rooms to the list of rooms requiring AFCI circuitry, as well as any "devices" (such as lighting) are to be protected in required areas as well. AFCIs are designed to protect against fires caused by electrical arc faults. While the sensitivity of the AFCIs helps in the detection of arc faults, these breakers can also indicate false positives, identifying normal circuit behaviors as arc faults. For instance, lightning strikes provide voltage and current profiles that resemble arc faults. This nuisance tripping reduces the overall effectiveness of AFCIs. Research into advancements in this area is being pursued. Also, AFCIs provide no specific protection against "glowing" connections also known as a High Resistance Connection, excess current, high line voltages or low line voltages. AFCI circuit breakers for use in a panelboard include a standard inverse-time circuit breaker. Glowing connections occur when relatively high electric current exists in a relatively large resistance object. Heat comes from power dissipation. This energy, when dissipated in a small junction area, can generate temperatures above 1000 °C (1832 °F) and can ignite most flammable materials. Bad wiring junctions can occur in utilization equipment, cords or in-situ wiring and especially in a defective switch, socket, plug, wiring connection and even at the circuit breaker or fuse panels. Terminal screws loosened by vibration, improper tightening or other causes offer increased resistance to the current, with consequent heating and potential thermal creep, which will cause the termination to loosen further and exacerbate the heating effect. In North America, high resistance junctions are sometimes observed at the terminations of aluminum wire circuits, where oxidation has caused increased resistance, resulting in thermal creep. No technology located in a circuit breaker or fuse panel could detect a high-resistance wiring fault as no measurable characteristic exists that differentiates a glow fault from normal branch circuit operation. Power Fault Circuit Interrupters (PFCI) located in receptacles are designed to prevent fires caused by glowing connections in premise wiring or panels. From the receptacle a PFCI can detect the voltage drop when high current exists in a high resistance junction. In a properly designed and maintained circuit substantial voltage drops should never occur. Proper wire terminations inside utilization equipment, such as appliances, and cords prevent high-resistance connections that could lead to fires. An AFCI does not detect high line voltage due to an open neutral in a multiwire branch circuit. A multiwire branch circuit has both energized wires of a 120-240V split phase service. If the neutral is broken, devices connected from a 120 V leg to the neutral may experience excess voltage, up to twice normal. AFCIs do not detect low line voltage. Low line voltage can cause electro-mechanical relays to repeatedly turn off (relay opens) and on (relay closes again). If current is flowing through the load contacts it will cause arcing across the contacts when they open. The arcing can oxidize, pit and melt the contacts. This process can increase the contact resistance, superheat the relay and lead to fires. Power fault circuit interrupters are designed to prevent fires from low voltage across loads. AFCIs may interfere with the operation of some power line communication technologies. Arc Fault Testing and Arc Fault Scenarios, Underwriters Laboratory. Six types of AFCIs are listed. ↑ Lee, Douglas A.; Trotta, Andrew M.; King, William H. (Aug 2000). "New Technology for Preventing Residential Electrical Fires: Arc-Fault Circuit Interrupters (AFCIs)" (PDF). Fire Technology. Kluwer Academic Publishers. 36 (3): 145–162. doi:10.1023/A:1015410726786. ISSN 0015-2684. Retrieved Feb 26, 2013. ↑ Ault, Singh, and Smith, "1996 Residential Fire Loss Estimates", October 1998, U.S. Consumer Product Safety Commission, Directorate for Epidemiology and Health Sciences. ↑ Stephenson, James, Ph.D. "Eliminating False Positives in the Detection and Location of sub 3ms Faults on AC/DC Lines Archived September 25, 2015, at the Wayback Machine." presented at the 2011 Aircraft Airworthiness & Sustainment Conference on April 19, 2011. ↑ J.J. Shea, "Glowing Contact Physics," IEEE Holm Conference on Electrical Contacts, Montreal, Canada, Sept. pp. 48-57, 2006.